Eight minutes after Marin Čilić won his semi-final last July, Wimbledon had produced a two-minute video of the match highlights. The 2017 Championships were the first time that players celebrating, crowd cheering and analysis of match data had been integrated into a highlights package by a system. Wimbledon used artificial intelligence (AI) to rank exciting sporting moments and automate content curation. The system allowed Wimbledon to produce highlights packages for fans to re-live or catch up on matches much more quickly than traditional manual techniques. It also increased the scale and scope of videos produced beyond the previous capacity of the AELTC video production team. Algorithms understand video content, such as the detection of a player celebrating. Audio is analysed to detect crowd cheering to determine the points in a match that may represent a highlight. IBM extended the recent work done by collaborators at MIT using a deep neural network called “SoundNet” as a feature extractor sound classification. In addition, match statistics were analysed for key points. The system combines the results of the video, audio and data analysis to identify the most exciting and important moments of the match. It then uses meta-data to generate graphics for the highlights to tell the story of the match, stories that were viewed 14.4 million times in 2017. This is just one example of Wimbledon’s use of AI to bring the moments that matter to fans. In 2017, Wimbledon provided a cognitive assistant, “Fred,” to personalise the experience for the fan to understand and engage with what is happening whatever their tennis knowledge. 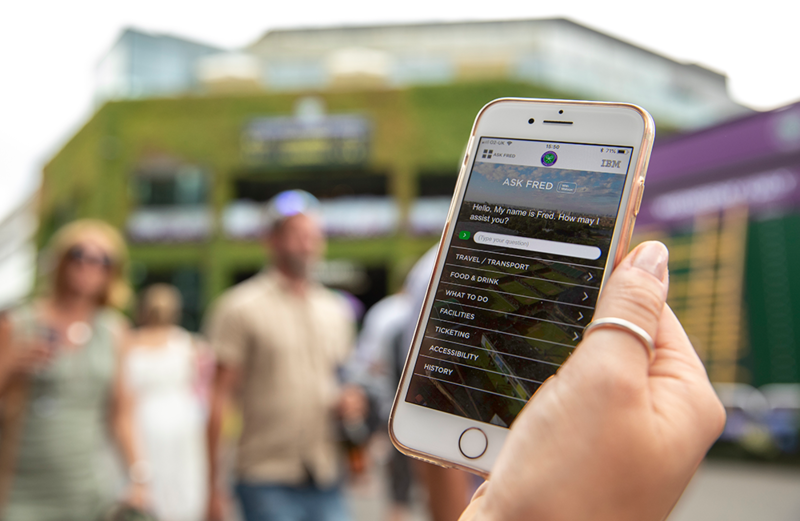 It was included with the Wimbledon apps to help guests prepare for their visit, and whilst on-site visiting the All England Lawn Tennis Club (AELTC) by providing information about services to make the most of their day. Most fans experience the Championships from further afield. Wimbledon has increasingly harnessed trending topics on social media over several years to engage fans through its digital channels. It combines conversations happening on many of the prevalent social media platforms with historical records including 23 years of articles, daily blogs and interviews, and statistics from 58,252,751 tennis data points captured since 1990 to facilitate debates and provide relevant and timely content. Video is increasingly important with growth of 75% in views in 2017 over 2016. Wimbledon’s digital team is guided in its decision making by understanding what is happening using AI. It extracts meaning out of text and other media using content discovery, natural language classifiers, visual recognition and other services available on the IBM Cloud. More is being learnt from less data than in previous years. Wimbledon relies on the IBM Cloud to deliver the digital experience of the Championships to fans around the world. This experience spans insights and content delivered through its website, apps, TV channel, social media and the world’s media. IBM uses AI, Watson for Cyber Security, to help protect Wimbledon’s infrastructure from cyber security threats. The team is presented with a description of a particular threat and a recommended set of actions based on Watson’s analysis of the threat. It enables the team to deal with more incidents in less time, up to 60 times faster than manual threat investigations. IBM’s security stopped nearly 200 million security events during The Championships last year. Watson combs through huge amounts of information, but its skill is putting it into context by combining structured data such as specific security events with white papers, research reports and blog posts. This year, Wimbledon has employed AI to celebrate the 150th anniversary of AELTC. AI has become the artist to create a poster. It looks like a water colour but is actually a mosaic made up of 9,000 images. These were selected from over 300,000 images in the AELTC’s archive using artificial intelligence to match image recognised content and colour tone. The Championships begin on Monday 2nd July. In the meantime, watch how 150 years of archive photography has been used to stitch together a single beautiful image. Learn more about the technology that powers Wimbledon here. Times and fans have changed. Sports enterprises haven't. Whether inspiring growth in an existing business, updating an old venue infrastructure, or designing a new stadium, you need three pillars for a winning game plan. Compelling facts and figures about fans, customers and what's at stake. Announcing IBM Sports Insights Central. The fusion of design, strategy, technology and data to improve fan engagement, team performance, and venue optimization.